The Metropolitan Museum of Art’s Grace Rainey Rogers auditorium (cap. 708) was overflowing with New Yorkers wishing to bid farewell to Charles Gwathmey, who died on August 3. And as impressive as the spoken tributes were by son Eric Steel, director Steven Spielberg, fashion designer Ralph Lauren, and anchor Brian Williams, not to mention by Peter Eisenman and Robert A.M. Stern, the real jaw-dropping detail was that Charlie could do 1,300 sit-ups in 10 minutes. We all knew he was dedicated to ideal proportions, but only suspected he was made of steel. He didn’t need to be made of such solid stuff to earn a permanent place in our admiration. 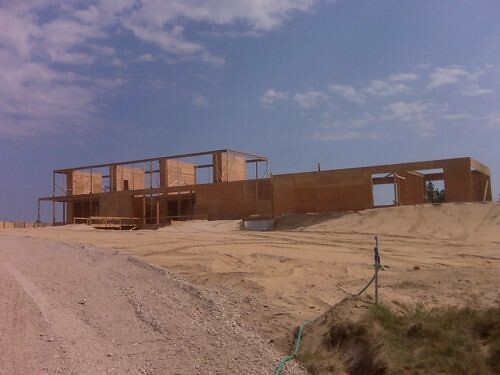 There is no more bizarre history of residential hubris than the multi-generational tale of overreaching at the 10-acre oceanfront parcel variously known as Chestertown, Dragon’s Head, Elysium, and now Calvin’s place, in the dunes of Southampton. In 1929, renowned antiques collector, horticulturist, and decorator Henry Francis du Pont completed the dignified, whitewashed brick, Colonial Revival manse designed by the equally dignified New York firm of Cross and Cross. It might have been preserved for posterity like a Newport “cottage,” but instead it passed through a few benignly neglectful hands before financier-turned-scofflaw-turned-tax-evading-felon Barry Trupin snatched it up in 1979 for $330,000. With Southampton architect Vello Kampman playing Dr. Frankenstein, the owner changed the name to Dragon’s Head, stripped the remaining original details, and enlarged the house (without benefit of permit) to 55,000 square feet, complete with 50-foot turrets, 16th-century Norman pub, and a shark tank. When Trupin went bankrupt in 1992, he sold the bloated castle to WorldCom’s Francesco Galesi for $2.3 million, who felled the turrets, renamed the white elephant Elysium, and put it back on the market for $45 million. Enter fashion mogul Calvin Klein, who snapped it up in 2003 for $30 million. This year, Klein performed a community service by razing du Pont’s ravaged remains. After working with British architect John Pawson for a while with no visible results, he turned to New York architect Michael Haverland, who has designed a much smaller replacement out of stucco and steel, but thoroughly Kleinian in sleekness. Smaller it may be in size, but it is no less imperious than the others in ambition. For at the moment, there’s a full-scale, plywood mock-up on the site with life-size plywood furniture, apparently built to provide a virtual-reality experience for Klein prior to building for keeps. If he’s looking for a new name for the joint, perhaps he’ll consider Fata Morgana.